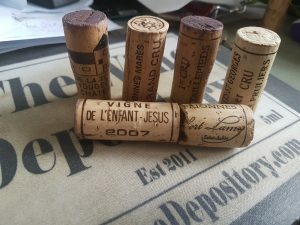 Drinking Wine From My Cellar – Burgundy 2006 and 2007. Do you need a reason to get together with friends and drink old wine from your cellar? No way! But, you have to make it an occasion. Why? Because you’ve bought these wines, and then aged them for many years. You’ve thought about these wines, maybe even bragged about them. Now is the time for all of that anticipation to end. For better or worse, you want to share it because if the wines are great, the shared experience is exhilarating. If they are … not so great… then you have people to commiserate with you. It is testament to my patience that I have managed to keep some amazing Burgundy in my cellar for over 10 years so this night could happen. 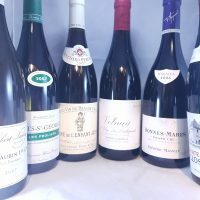 How often had I wanted to drink the Clos Vougeot? Every time I looked at my list, took something from the box or was feeling like a good drink. Not to mention I am an only child so I don’t share well. But last they did. And looking at them as a line up was far too appealing to not do. Drinking all six wines on my own is too much. Therefore, I settled on 6-8 people. It was booked out before I could blink and then we had two people pulled out at late notice. Oh well, six bottles of Burgundy for six people is actually OK with me and my single child mentality. After you’ve decided you are ready to open an old bottle or two, there is a number of decisions to be made. Or more correctly, I should say challenges to overcome. How many back ups are needed, if any? My solution was to open the bottles at 4pm. Mostly the timing was dictated by the time I had and the fact they needed to be dropped off in advance. Thanks to the universe for making that part easier. I could have had the restaurant open them but I didn’t want to cart 12 bottles in and then 6 bottles back home. They all looked great after tasting initially and retasting about 30 minutes later. At this stage I decided they would open up nicely with time so no decanting was required. And as they were only 10 years old, sediment would not be an issue. Actually, apart from Port which seems to throw a lot of it, I don’t mind a bit of old wine sediment. And nothing was faulty so no back-up wines were needed. That was a brave call because some faults can evolve with time. But I trust my palate and if wasn’t going to, there was no reason to open them myself. The only white of the night. I’ve been drinking these wines for a long time. Partly because St Aubin was (and still is) far more affordable than other white Burgundy. But also because Lamy offered amazing ‘bang for buck’. 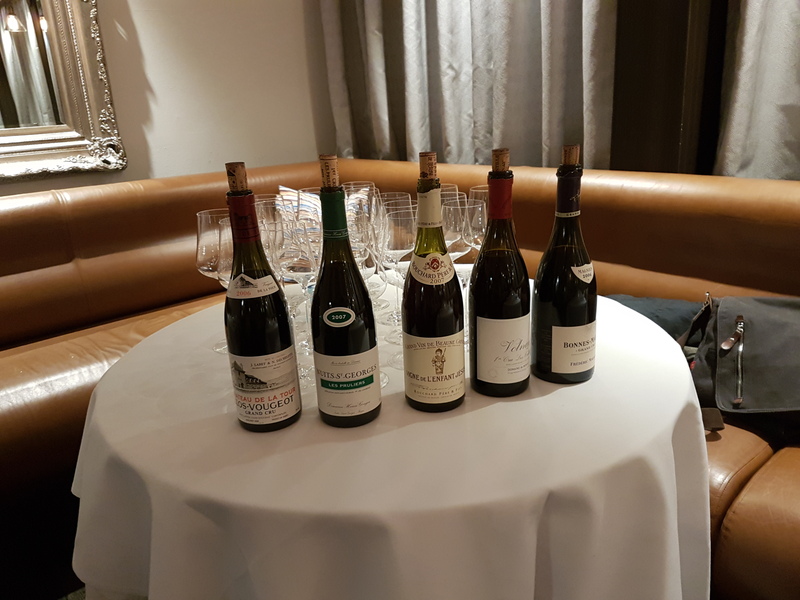 The Lamy wines were equal to a lot of Puligny and Chassange wines. By vintage 2007 I was buying them and putting them away because they were good young but really needed some time. At Philippe, this wine was looking a bit developed on the nose but the palate was fresh and precise. Earthy, toffee and peach on the nose. It was a little bit floral too when it warmed up. Shame about the nose as the palate was citrus, mango, mineral, cool and vibrant. The palate was long and had plenty of acid and freshness. I enjoyed the wine but will drink my last bottle sooner rather than later. The last sniff was from someone else’s glass and there was more still. Toasty oak and stone fruits were returning. Still, better to drink it now than find it undrinkable in 5 years. There is a lot of Gouges in my cellar. I love his wines. The fruitcake, cake and ironstone of Gouges are what I crave from the region. With age this wine has mellowed a lot but is still overt and tannic; as you would expect and want from Nuits. Red fruits, much spicier but probably less developed than the Bouchard. I would happily keep this wine for another 5-15. I’ve written less about this as it was young and tight. Great quality, but needs more time. Thankfully, a wine that takes so long to say is actually worth it. In 2008, Bouchard took me to this site and without knowing much about it I could sense it was special. Mid-slope, bathed in sunlight and just beautiful. Subsequent tastings at their Chateau in town confirmed the quality of this wine. A wine that they crop at Grand Cru levels and price at almost Grand Cru levels too. But having tasted it young and old now I can heartily endorse this treatment. Bold flavours, oaky and creamy in the mouth. Dark and blue fruits meld with pepper and earth. Full in the mouth, soft structure and with great harmony. At first glance you could overlook this wine. But when you stop to take in the complexity and the way everything on the palate works together, you’ll be glad that this Jesus is in your life. I would say this is in the drinking window now, but not looking old in the slightest. This is one producer I cannot get enough of. The Montille style is lean, perfumed and long finishing. The Domaine has great vineyards in Volnay, Pommard, Aloxe Corton and other parts of Southern Burgundy. The wines are now a lot more expensive than when I was collecting 10 years ago. Deservedly so as the Montille Premier Crus taste and drink more like Grand Crus. The Taillepeids is a great vineyard. Offering density, complexity and perfume. This wine is nuanced mineral, floral, red fruits, spice, meaty, earthy, leather. This wine could easily have been wine of the night but for one reason: Like the Gouges, it was just too young. Bonnes Mares is a wine that is never subtle. When we were in Burgundy in 2016, one of the guys really identified with Bonnes Mares because he was not used to drinking so much elegant wine. One of the guests suggested it was like a Shiraz style. And compared to the previous wines it was a good call. Obviously it was not showing the flavours of Shiraz but the depth, darkness and weight. Lots of dark fruits, oak, mineral and big in the mouth. The intensity was a highlight. But there was complexity, this wine evolved and changed with each taste. I think this was the easiest wine to drink of the line up and could easily have been wine of the night. This is my wine of the night. It took elements of all the wines and combined them. It was definitely young, and of all the wines this was the only one I didn’t have a back up for. So I opened it now as I didn’t want to drink it too old. It was visually browning at the rim, elegant, savoury, earthy, mineral. Red and blue fruits, ironstone, floral. The tannins were well integrated but pretty firm. Everything was there, in correct proportions and balance. It was satisfying and complete. But it was still evolving, I felt like more time would have seen it change for the better, but it would be a more gradual and subtle evolution. My first experience with Philippe Mouchel was at his Brasserie at Crown. I was taken there by a rep for a dinner with Bollinger Champagne (I think, this was a long time ago now!). What I do remember is the food was not like any French food I’d experienced in Melbourne before that time. Years later when a friend of mine wanted to visit a celebrity chef in Melbourne, I told him we are going to 24 by Philippe. Again, this was a few years ago now and this is where I learnt about his rotisserie chicken. 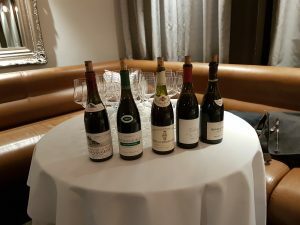 Since I had heard Philippe was opening in the old Brooks site, which is where I hosted an amazing Burgundy dinner a few years ago, I’ve been looking for a reason to visit. 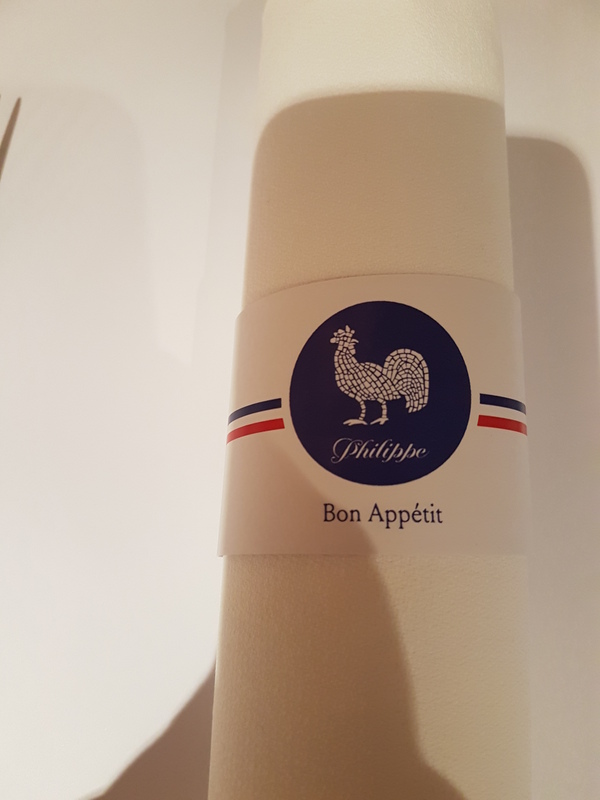 Philippe is bright, elegant and understated. It seats a lot more people than I would have thought. Has a beautiful bar open for casual or pre-dinner drinks and the intimate Salon Paul Bocuse for private dining. But most striking is the open kitchen that allows you to watch the chefs work as you dine. In fact, I believe you can book a small group to sit at the pass next to Philippe for a service. There seems to be an unofficial rule that French people in Melbourne fine dining have to be rude. But they’ve forgotten that and everyone was lovely and full of smiles. Although the wine line up was finalised well in advance, I opted to order a la carte for the meal. The proof of concept was not one of the six of us ordered the same combination of dishes. Sometimes it is nice to do a set menu designed to complement the wines. But to achieve the best results you really need to sit down and test the combinations in advance and then fine tune. If I had an unlimited budget and the spare bottles to achieve this I would opt for a set menu. But having said that, being able to choose your own adventure can really engage you in the experience. 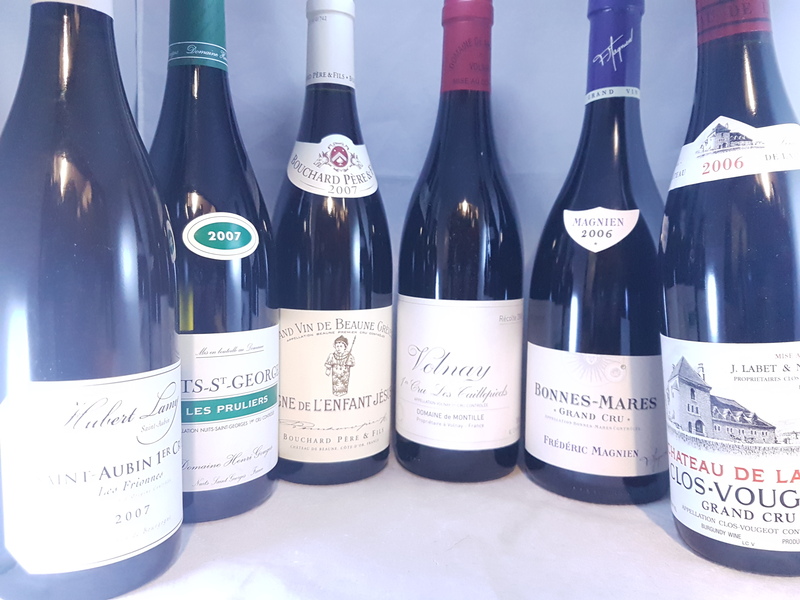 What do you drink with aged red Burgundy? Let me start with a statement uttered at Domaine Armand Rousseau dinner at Matteo’s. It was, “You can’t eat steak with red Burgundy”. On offer was a high marble score Wagyu steak. A delicious steak that I felt went perfectly well with fuller styled red Burgundy. The reason I bring this up is to say, duck does work together with Pinot BUT it is not the only match in the world. And in fact, duck is not even my favourite match for good quality Pinot. What did we eat? My entree was Wagyu beef tartare, pomegranate, Pommery mustard, horseradish. Bursts of flavour, hints of heat, satisfying texture. It complemented the Burgundy with savoury, spice, sweetness. All of it was nuanced and worked together. Just like the wines. The escargots was a melt in the mouth, buttery, garlicy goodness. Charcuterie was given the thumbs up. I want to go back to have their pate en croute. Steak and steak was on the cards but rotisserie chicken was ordered, of course. So succulent, great flavours that let the Burgundy shine through. I could have happily had that dish for entree and main in hindsight. A taste of the rare/medium-rare wagyu rump was a salty flavour bomb. The lamb and porterhouse were happy devoured. Please note, no ducks were consumed on our watch. I had no room for cheese, which was sad as there was still Bonnes Mares and Clos Vougeot left to drink. It made me so happy to sit down and see we would be drinking my Burgundy out of my favourite wine glass. I’ll save the whole story for another post but in short: Gabriel Glas makes good wines look amazing. Great wine + great food + great company = A perfect night out. I couldn’t fault anything and if I had my time again, I’d do it all the same. Even sharing the bottles knowing how good they are. As people left a few of us found there was still some wine to drink in the bottles, including the Grand Cru. As we sat, talking and enjoying the wines, they were still evolving and changing. Should I have decanted? Maybe. But the last sip I had of each wine was the best sip. And that is exactly how I want to end the evening. Rockford Basket Press Dinner at Highline. Will This Wine Improve in the Cellar? 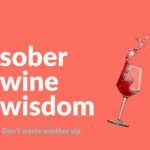 Sober Wine Wisdom – A practical online wine course that you can take with you anywhere and review at any time. For anyone who loves wine. Because the perfect cellar requires the perfect wine. See what the tastemakers have on special this week. Follow Phil, Charlie and Tempier as they strut the cellar fantastic. is your name on our list? Get offers, free stuff and our latest cellar finds before anyone else. Sign up for our E-News below! Every time you taste a wine it is an event. I would like to think it can be educational too. 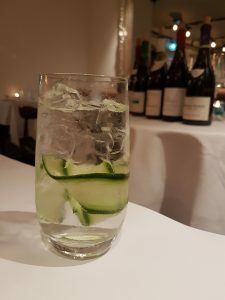 I hate stuffy wine events, so whether it’s a casual tasting or a Masterclass over dinner, I promise a fun, interactive and informative occasion… with great wine. Take a peak below or view all our events here. Your Own Private or Corporate Event @ Any venue you’re comfortable with. Wine is more than just a thing you drink. You share it with people you care about, you tell stories about the wines and wine places you’ve been. A well run wine tasting can be an experience of its own. The love of great wine is a concept that brings people together. Sharing it bonds people. This is an opportunity for you to share a special experience with family, friends, clients, colleagues or anyone you want to share some great wine with.Lets talk about how to make your event special.
. For a person under the age of 18 years to purchase or receive liquor (Penalty exceeds $500).